Title: Moonlit Cove - This is an original painting by U.K watercolour and soft pastel artist Greg Howard. 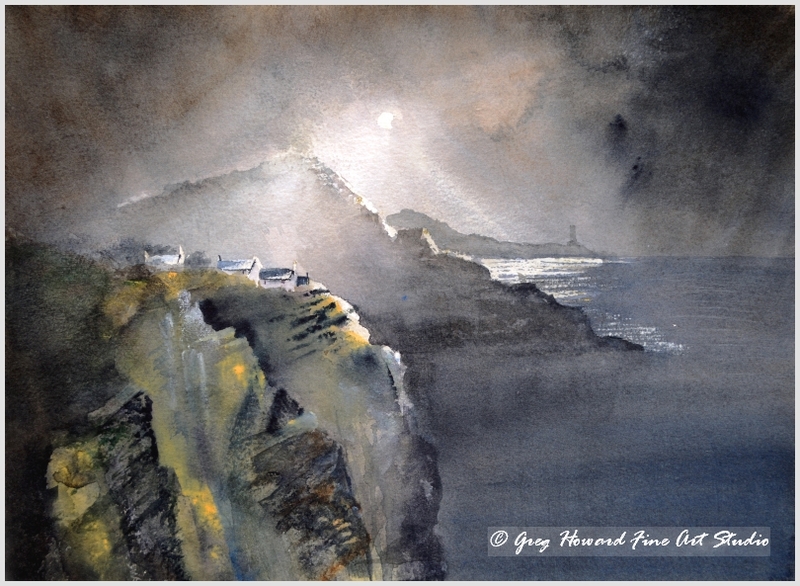 Title: Moonlit Cove – This is an original painting by U.K watercolour and soft pastel artist Greg Howard. I love this painting! The idea was so simple but at the same time quite difficult to pull off. I wanted to depict a quiet cove on the rocky wild coast under the moonlight. I knew the painting had to be practically black and white but me being me I had to get some colour in there somewhere so decided to add yellow lichen on the cliffs at the front. The light on the patch of water in the distance and the way the moonlight just catches tops of the cottages sitting on the top of the cliffs are what set this of and made it work. The original watercolour painting is 350mm x 255mm and is available either framed or unframed. Be the first to review “Moonlit Cove” Click here to cancel reply.